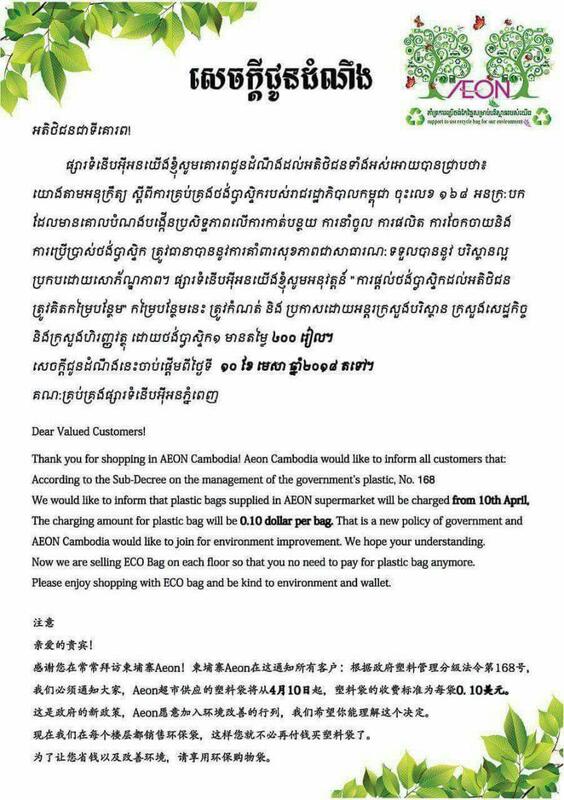 Phnom Penh (FN), April 10 - AEON Mall Cambodia announced additional charge of 10 cent per plastic bag supply to customers, effective from April 10, 2018, determined by the sub-decree issued by the Ministry of Environment (MoE) and the Ministry of Economy and Finance (MoEF). The measure aims to maximize the efficiency of importing, producing and using plastics for environmental protection. Heng Nareth, director-general of the MoE, said that the additional charge was not made to earn money, but to alert and educate people on environmental issues through responsible plastic consumption.